From the Introduction: "CHAPTER I THE towers of Zenith aspired above the morning mist; austere towers of steel and cement and limestone, sturdy as cliffs and delicate as silver rods. They were neither citadels nor churches, but frankly and beautifully office-buildings. The mist took pity on the fretted structures of earlier generations: the Post Office with its shingle-tortured mansard, the red brick minarets of hulking old houses, factories with stingy and sooted windows, wooden tenements colored like mud. The city was full of such grotesqueries, but the clean towers were thrusting them from the business center, and on the farther hills were shining new houses, homes--they seemed--for laughter and tranquillity. Over a concrete bridge fled a limousine of long sleek hood and noiseless engine. These people in evening clothes were returning from an all-night rehearsal of a Little Theater play, an artistic adventure considerably illuminated by champagne. Below the bridge curved a railroad, a maze of green and crimson lights. The New York Flyer boomed past, and twenty lines of polished steel leaped into the glare. In one of the skyscrapers the wires of the Associated Press were closing down. The telegraph operators wearily raised their celluloid eye-shades after a night of talking with Paris and Peking. Through the building crawled the scrubwomen, yawning, their old shoes slapping. The dawn mist spun away. Cues of men with lunch-boxes clumped toward the immensity of new factories, sheets of glass and hollow tile, glittering shops where five thousand men worked beneath one roof, pouring out the honest wares that would be sold up the Euphrates and across the veldt. 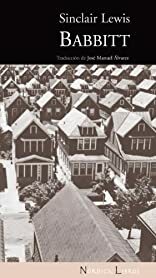 The whistles rolled out in greeting a chorus cheerful as the April dawn; the song of labor in a city built--it seemed--for giants"
About Sinclair Lewis (Author) : Sinclair Lewis is a published author of young adult books. Some of the published credits of Sinclair Lewis include Kingsblood Royal, Main Street (Unabridged), Arrowsmith, and Babbitt.